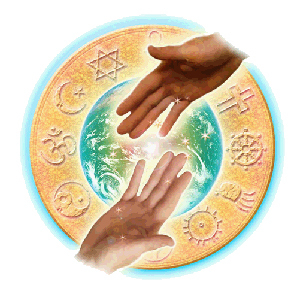 FIRST: Use this summary document as an introduction or review of the world's major religions. Prepared by Jim Kenney, director of The International Committee for the Peace Council (ICPC), and The International Interreligious Project for the 21st Century (IEP21). Veterans of ecumenical and interreligious dialogues have expressed the need for further clarity about the purposes of dialogue, as well as for some guidelines for appropriate dialogical behavior. Although purposes and guidelines, by their very nature, are ideal standards against which we measure ourselves with all our human frailties, perhaps the following will help persons involved in dialogue move closer to the ideal. 1.TO BREAK DOWN STEREOTYPES which block meaningful human interaction. 2. TO FOSTER MUTUAL UNDERSTANDING of the theological, sociological, political, and personal assumptions which motivate dialogue participants. 3. TO PROMOTE RECONCILIATION in those areas where misunderstandings and divisions exist, or, when apparently irreconcilable differences emerge, at least to develop further understanding and mutual respect. 4. TO APPRECIATE DIALOGUE AS AN END IN ITSELF, which informs the understanding and behavior of participants in other contexts. 5. TO SEEK TO PERSUADE DIALOGUE PARTNERS of the validity of their respective viewpoints on selected issues. 1. PARTICIPATE REGULARLY. Consistent, sustained involvement enables participants to place comments in a personal, "historical" context, and maximizes the opportunity for growth of mutual trust. 2. STICK TO THE SUBJECT. The refusal to introduce material extraneous to the dialogue, or to be diverted by the digressions of others, will allow maximum penetration of topics. 3. LISTEN! Avoid the temptation to be distracted. Instead of anticipating messages or responses, focus on the content and feeling of what is being communicated, in order to understand as fully as possible the meaning of the speaker. 4. BE SENSITIVE TO THE AMBIGUITY OF LANGUAGE. Be willing to clarify when confusion arises, to avoid needless misunderstandings. 5. DO NOT ATTRIBUTE OVERT MOTIVES TO DIALOGUE PARTNERS, when overt evidence is lacking, since such claims of causation are speculative, and potentially damaging. 6. SPEAK IN PARAGRAPHS, NOT SERMONS! Frame your comments in ways which communicate, but do not dominate, to avoid reactions among colleagues ranging from boredom to frustration. 7. AVOID INTERRUPTIONS. They hinder communication by interfering with the speaker's line of thought. 8. RESIST AD HOMINEMS -- arguments which attack the integrity of a person, and lack any rational basis. Although sometimes alluring, such pleas do not further fruitful dialogue. 9. SPEAK OPENLY AND HONESTLY ABOUT YOUR OWN FEELINGS AND THOUGHTS. Such candor includes sharing information which may be negative, as well as positive, about your own tradition and situation - and enables similar openness among dialogue partners. 10. RESPOND AS KINDLY AND GENTLY AS POSSIBLE TO THE UTTERANCES OF OTHERS. No one likes to feel that he/she may be pounced upon in the process of openly sorting out his/her thoughts. 11. TRY TO INTERPRET YOUR FAITH PERSPECTIVE CLEARLY AND ACCURATELY. To participate responsibly in dialogue, one should continue to cultivate a full understanding of one's own religious heritage and assumptions. 12. RESPECT THE INTEGRITY OF "WITNESS" - the declarations of religious and political convictions, even though disagreements about certain claims may exist. To do otherwise would call into question the commitment of dialogue partners. 13. PERSIST IN COMMUNICATIONS DURING CONFRONTATIONS, despite the tensions and frustrations which are a predictable part of dialogue. Sometimes, such perseverance can lead to dialogical breakthroughs - new levels of understanding. 14. RESIST STEREOTYPING. Be sensitive both to the similarities and the differences among dialogue participants. One of the purposes of dialogue is to break down over-simplified understandings about the group with which one is engaged in dialogue. 15. BE OPEN TO NEW INSIGHTS AND PERSONAL GROWTH - some of the fruits of dialogue. Opinions should not be rigidly predetermined. Openness includes a willingness to appreciate the treasures of truth in the viewpoints of dialogue partners.